For me, “Sussudio” was the last straw. Even though it was part of Phil Collins’s solo career, that tune irritated me so much that it threw a pall over everything he’d done before as Genesis’s lead singer. Never again could I listen to worthwhile Collins-era Genesis discs like Wind and Wuthering or A Trick of the Tail without cringing at the thought that this guy was also responsible for that soul-destroying radio hit of ’85. For Genesis freaks who haven’t acquired a similar aversion to Collins and aren’t put off by the suckiness of “Invisible Touch” or the tedium of “I Can’t Dance” this 10-disc collection could be a welcome stocking stuffer. It includes remastered/remixed CD and “DVD visual extras” versions of 1983’s Genesis, 1986’s Invisible Touch, 1991’s We Can’t Dance, and 1997’s …Calling All Stations…, which saw Collins replaced by Ray Wilson, who sounded a lot like Peter Gabriel. While Stations was largely ignored by the record-buying public, the other three albums represent the group’s most commercially successful period. 1983-1998–which also includes a bonus CD/DVD and a 48-page booklet–is the follow-up to last April’s similarly presented 1976-1982 collection. 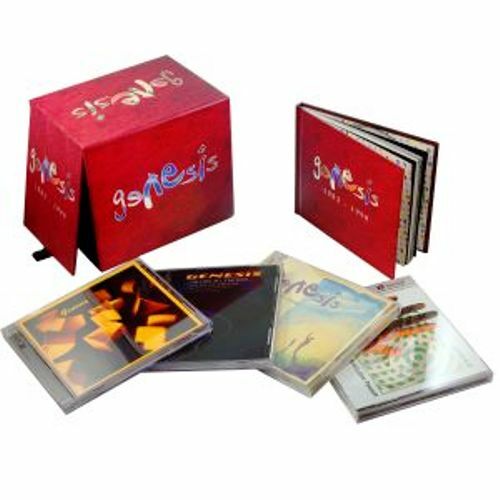 Rhino plans to release a third Genesis boxed set in February, which will span the years when Peter Gabriel was lead singer, and will thus be the real winner of the bunch. Prog-rock die-hards who just can’t wait that long can always get their Gabriel-era jollies via Genesis’s best album, 1973’s Selling England by the Pound.